Welcome to the island of beautifully diverse scenery and exceptional history and sights, welcome to Krk! Aim for the gold with the amazing island of Krk! Since the Antiquity, Croatia’s largest island has been known as Insula Aurea (Lat. “golden island”), and it has justified the label to the present day. A uniquely rich cultural-historical heritage which includes Glagolitic monuments and documents as well as former estates of the famous and once powerful Croatian noble family, the Frankopans, tells an exciting (hi)story of the island. Krk is also famous for the diversity of its landscape, which ranges from cliffs and rocks to beautiful coves, from hills with hardly any vegetation to fertile fields and lush greenery. With inhabitants passionately dedicated to nature preservation and sustainable tourism, the island is full of places that are a true sight for sore eyes. Walk down the history lane on Krk! Start by exploring the medieval historical core of the city which bears the name as the island itself, Krk. Walk along the city walls which date to Pre-Roman times, imagine what life once was like at the 13th century Frankopan castle (ticket price €2-3) and the main square, Kamplin, visit the 12th-century Cathedral and the 16th century City Hall. Not far from Krk and just opposite the town of Punat, the tranquility of the Košljun islet will take your breath away. Famous for the 15th-century Franciscan monastery, visitors can have a look at museum collections with religious, archaeological, ethnographic and nature exhibits including some valuable documents written in Glagolitic script (old script used by Croatians centuries ago). The ticket price ranges from €1,5-3. The most famous Glagolitic monument and considered the most important piece of Croatian literacy with the first ever mention of Croatians is the Baška tablet, found in Jurandvor near Baška (ticket price €3,5). This town is also known for the 15th century ‘Old man’ bell, the oldest in the area and found in the Church of St John the Baptist from the 11th century. Other top destinations and sights include the town of Vrbnik and Omišalj. The picturesque town of Vrbnik, situated on a hillock over a cliff in the eastern part of the island, is famous for the most narrow street in the world, Žlahtina wine and its important Glagolitic heritage. Equally charming is the town of Omišalj, one of the oldest settlements on the island, with its historical streets, where time seems to have stopped. Not far from Omišalj, visitors can discover the remains of the Roman town from the 1st century Fulfinum and the early Christian complex Mirine from the 5th century. Reconnect with nature on Krk, an island with an exceptional display of its tremendous force! Find a refreshing spot away from the heat in the Biserujka Cave in the northwest of the island, near Omišalj. For just €3-4 (ticket price in 2018), you get to appreciate the extraordinary cave formations, forgetting you are actually on an island. Just south of the cave in the Klimno bay, visitors can literally roll in the mud and do so for a very good reason. Concretely, the healing mud found at Meline locality is excellent for the skin and a great source of entertainment for all age groups. Hike to the top for the views and the possibility to spot Eurasian griffons, falcons, eagles and other bird species. Ornithological reserve Kuntrep, on the eastern side of the island and not far from Baška, has been a protected area for almost 50 years. The entry ticket is free of charge, the untouched nature - priceless! Sandy, rocky or pebbly. Secluded and difficult to reach or easily accessible man-made with great facilities and services. It is impossible not to find the perfect beach that completely caters to your taste and needs, since the beaches are as diverse as the landscape of the island. Krk island is also widely known for a great number of beaches which have been awarded the Blue Flag status, a guarantee of high quality services and environmental management. Such beaches are located all over the island, in Krk, Punat, Baška, Šilo, Soline, Glavotok, Omišalj, Njivice, Malinska. An example of a Blue Flag beach is Dražica beach in Krk. Surrounded by lush Mediterranean greenery, this partly rocky and pebbly beach is a great choice for families with children. Equally beautiful are also two other Blue Flag beaches in Krk, Ježevac and Porporela, which also provides access for people with disabilities. Another favourite for families with children is Vela Plaža in Baška, considered to be one of the most beautiful beaches on the Adriatic coast. With a long stretch of shallow water, the beach is perfect for families with children, but it is rather crowded during peak season. Visitors looking for more privacy can head to Vela Luka beach, near Baška. Situated in a breathtaking bay, this beach requires a lot of effort to be reached, which involves a hiking trip or a boat ride, but it is definitely worth it. Other magnificent beaches which are rather difficult to access include Oprna beach near Stara Baška or Potovošće near Vrbnik. Search, find and enjoy the secret to a long life on Krk! Appreciate the various dishes of a light Mediterranean diet, consisting in locally grown produce, seafood and fish, excellent meat, prepared with a drop of exceptional olive oil and a pinch of herbs such as rosemary, bay leaf, parsley, all of which grow on Krk. Treat yourself to an authentic traditional meal at a restaurant or visit events celebrating traditional food and wines, which take place throughout the year. Pick your favourite Krk specialty from a variety of options! Just remember that meals made with seafood, fresh fish or the world famous Kvarner scampi, Krk lamb meat or traditional homemade pasta šurlice go best with a glass of excellent Krk wine, such as Vrbnička žlahtina. For a sweet closure of a great meal, try presnac, the irresistible Krk island dessert made with sheep cheese. Up and down, and all around! The island of Krk is an endless source of inspiration and possibilities for everyone who wants to spend their holiday actively. Use the numerous sports facilities available all over the island to play a game of (table) tennis, beach volleyball, mini golf, basketball, handball, football. Learn to play bocce, a favourite pastime on the Adriatic coast, or try a water sport, from banana-lifts and jet skis to water skiing and surfing. 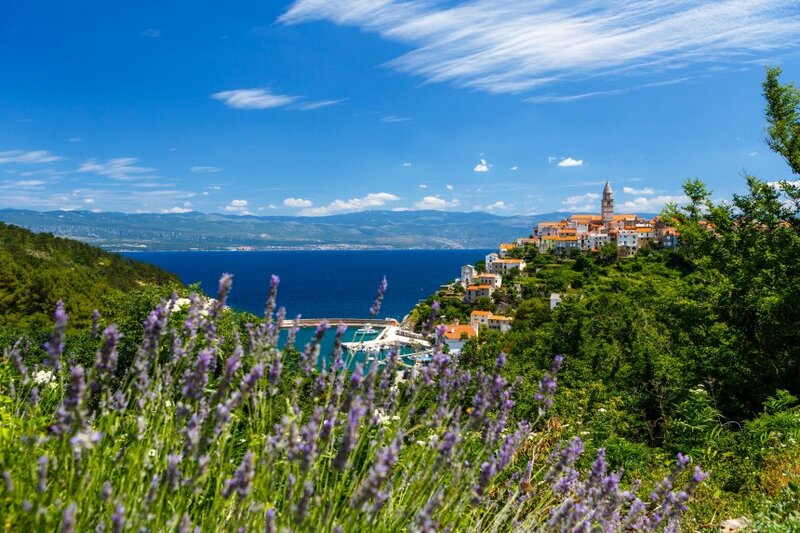 Set sail around the island and explore Kvarner Bay! Krk is an excellent sailing destination with a large number of available berths and moorings as well as Croatia’s oldest marina in Punat. While sailing, use the opportunity to go snorkeling in secluded coves or learn to dive. After all, the underwater world near Krk is full of exciting locations to explore - reefs, caves, cliffs, wrecks, tunnels. On land, hike or hop on a bike! There are 300 km of hiking trails on the island - from light promenades along the coast to more challenging and demanding paths which lead through untouched nature and to spectacular views. Most of the trails can be used as cycling routes as well and various events during the year promote the island as one the best cycling destinations on the coast. Be active, eat delicious food and learn about tradition and customs of Krk! A variety of events are held every year which present to the visitors the island in its full glory. In May 2018, try traditional food such as lamb meat and cheese at Krk Food Fest, then try Vrbnička žlahtina wine at Žlahtina Festival end of June, followed by Šurlice Days mid July, both in Vrbnik. Sweeten the last days of summer with the Fig Festival, beginning of September in Krk. Summer of 2018 is dedicated to the noble family of Frankopans with numerous events taking place all over the island: Krk Summer Festival (July/August), Medieval Festival in Krk (August), Vrbanske užance (August). The traditional fair Lovrečeva, held in Krk for almost 500 years, is also dedicated to the Frankopan family. The fair includes medieval fair, tournaments and traditional handicrafts and souvenirs, not to mention the amazing food specialties. Fans of cycling can join in the events taking place in May such as Spring Bike Adventure in Krk or Đir po Dubašici in Malinska. For the autumn experience of Krk, in October 2018 cycle along its trails starting from Punat (‘Osvoji Crni Biser’ cycling event) or take part in Baška Outdoor Festival, which includes hiking, cycling, rock climbing and a zip-line. Find your adventure on Krk! Apart from being an excellent holiday destination, the island offers its visitors various possibilities for a unique holiday experience. Families with children will be excited to discover Aquarium in Baška (ticket price: €3-4), Aquarium/Terrarium (ticket price: €3-5) and Tropical Aquarium (ticket price: €3-4), both in Krk. Why not also take a walk on the bottom of the sea at the Underwater Park in Punat? Between Punat and Krk, fans of adrenaline can find another adventure - ski lift Dunat. Have fun wakeboarding and water skiing, regardless if you are a beginner or already have previous experience. The prices depend on the amount of time spent there, with the starting price at a bit less than €20 for one hour with all equipment included. For the most amazing views of the southern part of Krk island, Baška and Prvić island, opt for a zipline adventure in Treskavac, between Krk and Baška. It’s a 2-hour ride at €50 per person and a unique experience your family will never forget. Simple and fast - all you have to do is cross the bridge when you come to it, literally. Situated just 30 km from Rijeka, the island of Krk is the easiest Croatian island to reach since it is connected to the mainland by the Krk Bridge. When arriving by a motorized vehicle, just follow the signs on the A6 (from direction Zagreb) and A7 (from direction Rijeka) leading to Krk. The current bridge toll in 2018 is a bit less than €3 for motorbikes, €5 for personal vehicles and up to €11 for vehicles with camper trailers. For even more comfortable and quick arrival, fly to Krk to the airport near Omišalj. Don’t be confused by the fact that it is called Rijeka Airport, when it is actually located on the island. Countries from which you can reach Krk by plane in 2018 include Austria, Germany, Latvia, Israel, Holland, England, Sweden, Estonia, Belgium, Norway, Poland, France. Sunny side up! The island is one of the sunniest parts of Europe, with the average annual sunshine of 2500 hours. The mild Mediterranean climate with pleasant temperatures makes Krk an excellent holiday destination already in spring, even though the sea temperature peaks in the summer with generally more than 23°C. Find your home on holiday that perfectly suits your preferences on the island of Krk! Choose the best camping pitch to reconnect with nature. Decide on a mobile home for a bit more comfort while camping. Or allow yourself to be pampered and enjoy a carefree holiday in a hotel. Check out various hotels on Krk and opt for the one that perfectly caters to your needs with cozy rooms, excellent food, proximity to the beach, extra facilities such as swimming pools, sundeck, lounge areas and entertainment programme and animation both for children and adults. Krk - it maybe is a difficult name to pronounce, but it is a place where enjoying a great holiday comes easy. It’s a place where families with children can find the ideal beach and entertainment, where adults can completely relax and dedicate some time to their wellbeing and be active, away from everyday stress. It’s a place with an amazingly varied landscape, rich culture and history, exciting tradition and cuisine. It’s a place you can call your perfect holiday destination! For more details about the fulfilling holiday awaiting you on Krk, you are just a click away!